In this video, Dr. Huntoon discusses High Cholesterol. Click on the link below to listen to the radio show about Cholesterol and Inflammation. Before you begin the suppressive statin medications that will lead you to having Diabetes, consider ALL your non-medical options first. When you are ready to address the cause of your High Cholesterol, we are here to serve you. Your blood cholesterol level may have a lot to do with your chances of getting heart disease, as High blood cholesterol is one of the major risk factors for developing heart disease. A risk factor is a condition that increases your chance of getting a disease. In fact, the higher your blood cholesterol level, the greater your risk for developing heart disease or having a heart attack. Heart disease is the number one disease killer of women and men in the United States. Each year, more than a million Americans have heart attacks, and about 55 percent of those people die from heart disease. How Does High Blood Cholesterol Lead To Heart Disease? When there is too much cholesterol (a fat-like substance) in your blood, depending on the ratio of good to bad cholesterol, it can build up in the walls of your arteries. Over time, this buildup causes "hardening of the arteries" so that arteries become narrowed and blood flow to the heart is slowed down or blocked. The blood carries oxygen to the heart, and if enough blood and oxygen cannot reach your heart, you may suffer chest pains called angina. If the blood supply to a portion of the heart is completely cut off by a blockage, the result is a heart attack. High blood cholesterol itself does not cause symptoms, so many people are unaware that their cholesterol level is too high. Therefore, it is important to find out what your cholesterol numbers are because lowering cholesterol levels that are too high may lessen the risk for developing heart disease and reduces the chance of a heart attack or dying of heart disease. This is true even if you already have it. Maintaining healthy cholesterol numbers is important for everyone--younger, middle age, and older adults; women and men; and people with or without heart disease. HDL (good) cholesterol protects against heart disease, so for HDL, higher numbers, generally, are better. A level less than 40 mg/dL is low and is considered a major risk factor because it increases your risk for developing heart disease. HDL levels of 60 mg/dL or more help to lower your risk for heart disease. If your HDL levels are above 90, this indicates a hormonal problem and should be looked into for the underlying cause. Be careful, as your Medical Doctor will not acknowledge this nor look into it. Triglycerides can also raise heart disease risk. Levels that are high (100-199 mg/dL) or extremely high (200 mg/dL or more) may need treatment in some people. The simplest way to treat this is to stop all refined sugar in your diet. Triglycerides are a measurement of your body consuming to many Completely Refined And Processed (CRAP) sugar foods. Triglycerides are the storage form of sugar that is being transferred to your fat depots. This number, when measured will give you an idea of how much Completely Refined And Processed(CRAP) sugar you are eating and you would need to sit with a Holistic Chiropractor to discuss your diet history and how to change this number. This is also a good number to understand the likelihood of developing diabetes when this number stays elevated (above 130). Diet: Saturated fat in the food you eat may make your blood cholesterol level go up. The amount of Completely Refined And Processed (CRAP) foods also matters. Reducing the amount of CRAP food, along with reducing saturated fat in your diet can help to lower your blood cholesterol level. Weight: Being overweight is a risk factor for heart disease. It also tends to increase your cholesterol. Losing weight through aerobic activity can help lower your LDL and total cholesterol levels, as well as raise your HDL and lower your triglyceride levels. Physical Activity: Not being physically active is a risk factor for heart disease. Regular aerobic activity can help lower LDL (bad) cholesterol and raise HDL (good) cholesterol levels. It also helps you lose weight. You should try to be aerobically active for 30 continuous minutes on most, if not all, days. Things you cannot do anything about also can affect cholesterol levels. These include: Age and Gender. As women and men get older, their cholesterol levels rise. Before the age of menopause, women generally have lower total cholesterol levels than men of the same age. After the age of menopause, women's LDL levels tend to rise. Heredity. Your genes partly determine how much cholesterol your body makes. High blood cholesterol can run in families. This is more likely due to learned behavior and repeated family patterns than an actual genetic component. Step 2: How many major risk factors do you have? If you have 2 or more risk factors in the list in Step 1 above, use the attached risk scoring tables (which include your cholesterol levels) to find your risk score. Risk score refers to the chance of having a heart attack in the next 10 years, given as a percentage. If you have 1 out of the 6 listed, you are at 16.67 %. 2 of 6 is 33.3 %. 3 of 6 is 50 %. 4 of 6 is 66.6 %. 5 of 6 is 83.3 % and 6 of 6 is 100 %. My risk score is ________%. So What Has Happened To Our Health? Since all of our food seems to be of the CRAP variety; all our water has been “purified;” the air we breathe is full of pollutants, and everyone is lathering up with sun-screens and sunblocks that block our body’s ability to manufacture the one free vitamin nature provides; what are we to do if we choose to be healthy? It certainly makes for an uphill battle. When the body receives everything it needs, the cells are happy and healthy: all is well and we have HEALTH. And this is ideal. DEDIFFERENTIATION where the cells begin to lyse (break), fibrosis, scar, or mutate. Do you know what you call it when a cell mutates? CANCER! And we are all subject to this to one degree or another. The damage associated with all of this breakdown within the body causes the body to react/respond by desperately trying to repair the problem. It does this by producing a white waxy substance known as cholesterol. It acts like joint compound like one would use to repair a crack in a wall within their house. Unfortunately, this is the bad cholesterol known as LDL cholesterol. And it lays down the cholesterol within the arteries in an effort to repair the damage being caused by eating CRAP foods, having Leaky Gut Syndrome and being exposed to the Digestive System Disruptors. Each of these will drive up the production of bad cholesterol. Dr. Huntoon has quite the history of making sense out of the High Cholesterol Phenomenon. Helping you understand the exact mechanism for elevated cholesterol, inflammation and ultimately heart disease is vitally important if you want to avoid all the medical hoopla around this money making disease condition. The good news is that you do not have to have high cholesterol. And when you learn the truth about how easy it is for anyone to have healthy cholesterol levels, without the litany of medications known to have harmful side-effects, it should be important. Consult with Dr. Huntoon so he can help you understand your solution out of this unnecessary condition. It is truly solvable. Working with a Holistic Chiropractor who can help you develop a well-rounded, multifaceted approach to restoring balance in your body by addressing lifestyle and dietary changes will be best for your overall health. Whole Food Supplementation is the best initial change anyone can make when looking to restore balance and address the underlying cause of elevated cholesterol. Eliminating or greatly reducing the Completely Refined And Processed (CRAP) foods from your diet while starting on specific Heart Health Whole Food Supplements will create the most amount of change in the shortest time. The main goal of cholesterol-lowering treatment is to lower your LDL level enough to reduce your risk of developing heart disease or having a heart attack. The higher your risk, the lower your LDL goal will be. 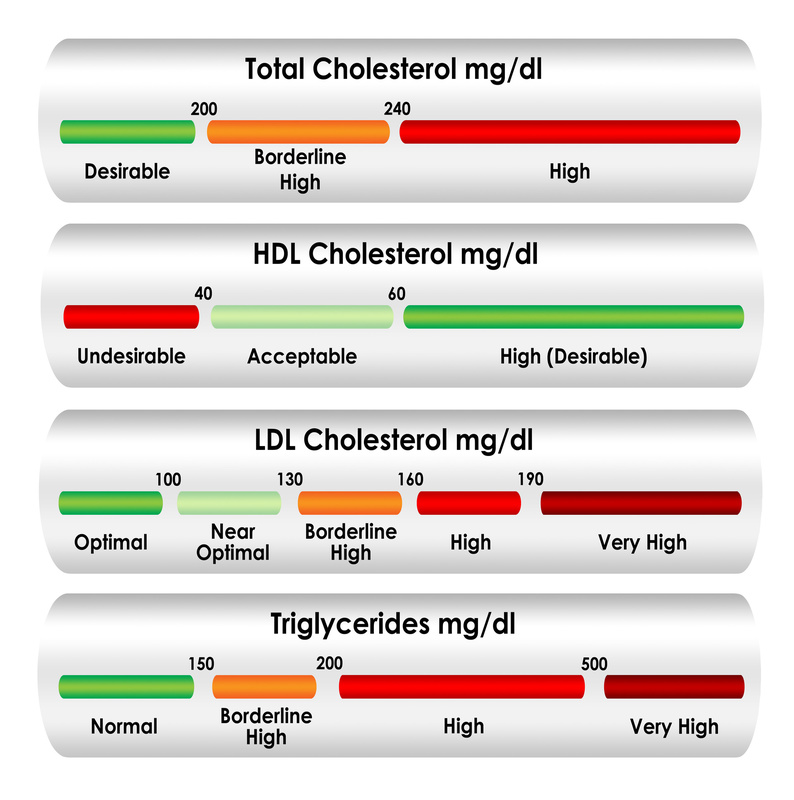 To find your LDL goal, see the Categories below to find your risk category. Therapeutic Lifestyle Changes (TLC)--includes a cholesterol-lowering diet (called the TLC diet), physical activity, nutritional supplementation and weight management. TLC is for anyone whose LDL is above the ideal. Working with a Holistic Chiropractor who can help you develop these changes is warranted. By taking specific whole food supplements specific to your personal health needs is ideal and your Holistic Chiropractor can advise you with this. Reducing the amount of Completely Refined And Processed (CRAP) food in your diet will be the biggest difference maker in lowering your cholesterol levels. Drug Treatment--if cholesterol-lowering drugs are needed, they are used together with TLC treatment to help lower your LDL. Beware of possible side-effects and be sure to have your Medical Doctor work closely with your Holistic Chiropractor. Category I, Highest Risk, your LDL goal is less than 100 mg/dL. You will need to begin the TLC diet and Whole Food Supplementation treatment to reduce your high risk even if your LDL is below 100 mg/dL. If your LDL is between 100 and 110, you will need to start Whole Food Supplementation treatment at the same time as the TLC diet. If your LDL is above 110 mg/dL, you may also need to start drug treatment together with the TLC diet if your doctor finds your risk is very high, for example if you had a recent heart attack or have both heart disease and diabetes. Category II, Next Highest Risk, your LDL goal is less than 130 mg/dL. If your LDL is 130 mg/dL or above, you will need to begin treatment with the TLC diet and Whole Food Supplementation treatment. If your LDL is 130 mg/dL or more after 3 months on the TLC diet and Whole Food Supplementation treatment, you may need drug treatment along with the TLC diet and Whole Food Supplementation treatment. If your LDL is less than 130 mg/dL, you will need to follow the heart healthy diet for all Americans, which allows a little more saturated fat and cholesterol than the TLC diet. Category III, Moderate Risk, your LDL goal is less than 130 mg/dL. If your LDL is 130 mg/dL or above, you will need to begin the TLC diet with Whole Food Supplementation treatment. If your LDL is 160 mg/dL or more after you have tried the TLC diet for 3 months with Whole Food Supplementation treatment, you may need drug treatment along with the TLC diet and the Whole Food Supplementation treatment. If your LDL is less than 130 mg/dL, you will need to follow the heart healthy diet for all Americans. Category IV, Low-to-Moderate Risk, your LDL goal is less than 160 mg/dL. If your LDL is 160 mg/dL or above, you will need to begin the TLC diet with Whole Food Supplementation treatment. If your LDL is still 160 mg/dL or more after 3 months on the TLC diet with Whole Food Supplementation treatment, you may need drug treatment along with the TLC diet to lower your LDL, especially if your LDL is 190 mg/dL or more. If your LDL is less than 160 mg/dL, you will need to follow the heart healthy diet for all Americans. This is a low-saturated-fat, low-cholesterol eating plan that calls for less than 7percent of calories from saturated fat and less than 200 mg of dietary cholesterol per day. The TLC diet recommends only enough calories to maintain a desirable weight and avoid weight gain. If your LDL is not lowered enough by reducing your saturated fat and cholesterol intakes, the amount of soluble fiber in your diet can be increased. Certain food products that contain plant stanols or plant sterols can also be added to the TLC diet to boost its LDL-lowering power. Losing weight if you are overweight can help lower LDL and is especially important for those with a cluster of risk factors that includes high triglyceride and/or low HDL levels and being overweight with a large waist measurement (more than 40 inches for men and more than 35 inches for women). Regular physical activity (45 minutes of Aerobic activity on most, if not all, days) is recommended for everyone. It can help raise HDL and lower LDL and is especially important for those with high triglyceride and/or low HDL levels who are overweight with a large waist measurement. Dr. Huntoon has extensive experience with eliminating this concern for many of his patients over the years. Discussing what your specific situation is and how he can help you restore optimal cholesterol and health would be a great reason for a consultation with Dr. Huntoon. This is the best place to start. Developing a healthy life-style with proper guidance from your Holistic Chiropractor is the best prevention when considering how to approach your health. Considering your health history, your diet history and your family history will help the two of you develop a specific plan to address your high cholesterol concerns. Avoiding medication, if possible, is important. Sometimes it is necessary or you may already be on it. Appreciate the stress it puts on your liver and how it suppresses normal cholesterol production will be problematic over time. The chief side-effect associated with cholesterol lowering medicines is diabetes. Please discuss this with your medical doctor when you are invited in to have your liver function tests related to detecting damage from the medication. Acupuncture, Homeopathy or Naturopathy may also be considered when looking to restore balance and harmony to your body.